That might not appear immediately obvious, given the diminutive stature of Kilkenny's 2016 All-Ireland-winning captain. "The big hits are what you look for I suppose, but even the way they can use their feet, their footwork, their overall skill and speed . . . it's something you'd aspire to really, when you see the way they train," Quilty explains. "Footwork is hugely important, trying to get on the turn. The NFL is different when they're running their routes and things like that. They have a set amount of metres they have to run before they can turn so that makes it a little bit easier for them, whereas camogie is unpredictable, you don't know what way the ball is going to bounce or turn or what way it's going to be played. But there are some similarities in terms of using your fast feet to get away from tackles and things like that." That is especially useful when you're a 5' 3'' specialist corner-forward. Speed of thought and movement, deft touch and clinical finishing are vital, especially with the physicality of camogie going through the roof in recent years, and tactical advancements making space very hard to come by for inside attackers. "It depends on the way you're setting up. At the end of the day, if you're working hard, you'd be hoping that your skill might come through. Stature doesn't make a difference. You can see it with the hurlers." Two-time Super Bowl hero Peyton Manning is Quilty's favourite NFL player. "When I was growing up, he was the man, himself and Tom Brady. I was an Indianapolis Colts fan at that stage and it was just the way he was able to sit in the pocket, he never really rushed it, he was able to relax and pick out the perfect pass. That's important, to make the decisions at the right time, which you would try to bring into your own game, to not rush things, to survey the surroundings and make up your mind from there." Quilty and her then-partner (now wife) Donna travelled to Wembley to see a game a few years ago. Camogie has gotten in the way of their dream of taking in an encounter on American soil and Quilty is very aware of what Donna might be giving up to ensure she has the right environment to prosper as an elite sportsperson. "It's something we're trying to do every year, go see a game, but with club camogie and other things, it didn't suit us but the hope would be to get over to see the New England Patriots. Maybe next year. "I'm lucky that Donna comes to all my matches and is interested. Even if we are away at games or training, she's very understanding and supportive. She wants me to do the best I can. It's about finding the right person." It isn't just NFL and Manning that gets the 28-year-old Mullinavat star fired up off the pitch. Cristiano Ronaldo is someone she admires too and that must lead to some animated Ballon D'Or conversations in a dressing room shared with Lionel Messi and Barcelona acolyte, Anne Dalton, a regular at Camp Nou. "There's some good banter," Quilty agrees with a chuckle. "I always liked Ronaldo - he's good looking and he's great at sport, what else do you want? I suppose where Anne would think of Messi's skill, I'd be more about the athleticism of Ronaldo, he never really gets injured, he always looks after his body really well. You can see the physical shape he's in. The only thing I dislike a little bit about him is he's selfish, but maybe that's what makes him great; he has the confidence to take it on and that's something you need." 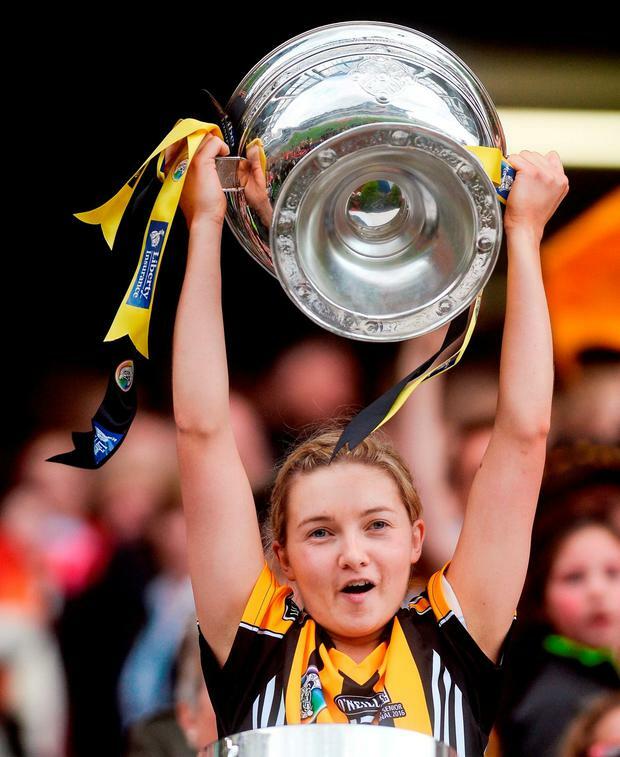 It has been an interesting time for Quilty after becoming the first Kilkenny player to collect the O'Duffy Cup since her manager Ann Downey had been presented with it 22 years previously. Part of a golden generation of underage players, she had garnered a plethora of All-Ireland medals at under-16 and minor level. In 2017, she got married but lost her place in the Kilkenny team and had to make do with regular incursions from the bench. "Everyone has their role within the team so it's important if you're not starting to be switched on. You could come into the fold at any stage, so you have to know what your job is. I wouldn't be a sulker - you have to trust the management that the 15 they're putting out there is the 15 they feel is the best to perform on that day. So last year, it was about getting behind the girls, which I did, and when called upon I was ready to come in and hopefully I could add to it. "When you are sitting on the bench, you might see little things, people might turn a certain way. They're just small things but you might be able to pick up on them so that when you do get in you can make a difference." She has wrestled the number 15 jersey back this year and will be in from the start as a familiar opponent blocks the route to the ultimate prize. "Cork are a formidable side. Last year went down to the wire and we were unlucky to lose in extra-time and the year before, it went to the end as well but we got over the line. There's never going to be much in it. Whoever is going to come out and finish stronger might have the edge at the end of the day."